The 2018 edition of the Middle River Lighted Boat Parade sets sail on Saturday, November 24th. 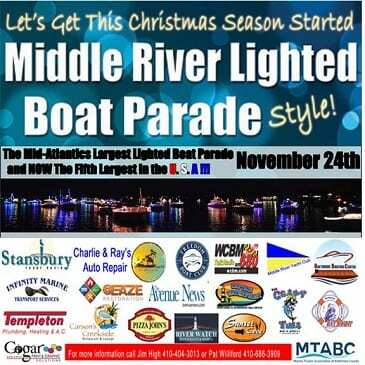 The Middle River parade of lighted boats is the largest in the Mid-Atlantic and the fifth-largest in the U.S. The annual event is organized by Jim High and Pat Williford of the Baltimore Boating Center. The parade can be viewed from each of the four waterfront restaurants participating in the parade…Carson’s Creekside, The Crazy Tuna, Riverwatch, and Sunset Cove. The parade can also be seen from Kingston Park from Wilson Point Park.